Sounds ridiculous, doesn’t it? Even beginners in statistics know there should only be one variable per question. But this is how we’re currently measuring Facebook engagement, by mixing apples and pears, by mixing (almost) unrelated engagement actions. However, this measure is flawed for several reasons and makes it especially unsuitable for benchmarking. Want a real-life example? 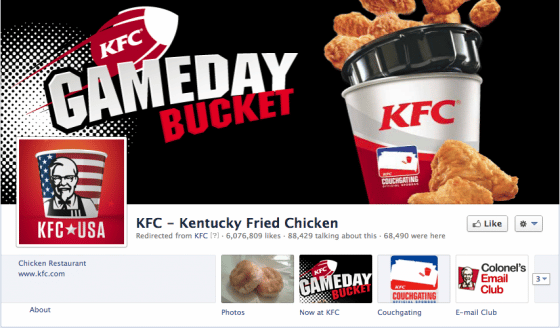 At the beginning of this year KFC’s Facebook page has experienced a spike in its “People Talking About This” count because the number of comments have exploded during the period. This growth in comments resulted in a sharp increase of the Page’s Engagement Rate too. Great for KFC! Competitors were probably ashamed by their poor performance, compared to KFC’s brilliant Engagement Rate. I hope they didn’t, because no engagement at all would probably have been better than KFC’s during this period. Indeed, looking at it in details, the reality is a lot less attractive than previously thought. 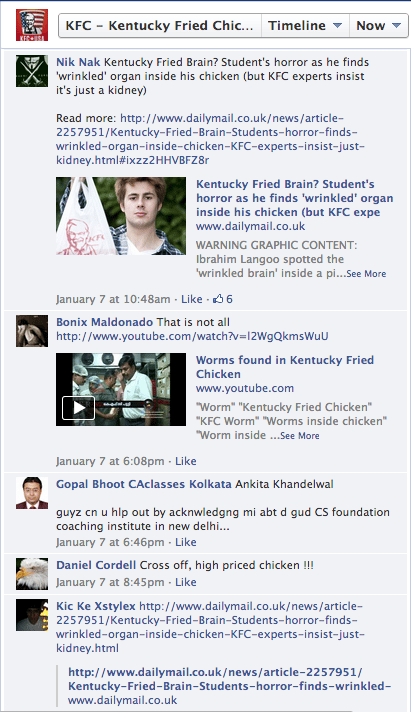 Oh yes, KFC’s Page had a lot of comments. The only (minor) problem is that 90% of them were hate comments or spam! Bearing in mind the previous example, we can bet KFC would certainly have preferred a lower Engagement Rate. “Like”- public sign of affinity, have a positive value. “Comments” – public sign of conversation, could either be positive, neutral or negative. “Shares” – public sign of endorsement, tend to have a positive value, even if you can’t be sure about this. There is a good reasons why statisticians hate “compound metrics” or worse, “grades”. These metrics, based on multiple variables, hide all the details and make any interpretation hazardous, if not impossible. How to compare your Engagement with your Competitors? The ACE model. It’s pretty simple in fact. You just have to split the three variables “Affinity” (likes), “Conversation” (comments) and “Endorsement” (shares) to compare things that are indeed comparable. We call it the ACE model (for Affinity/Conversation/Endorsement). Using only the “Likes” count (per fan), it is very easy to identify the brands that have posted the content that is most popular with their fans. Similarly, the number of “comments” (per fan) will accurately reflect the capacity of a brand to generate conversation, be it positive or negative, compared to its competitors. Finally, the number of “shares” rapidly helps to shed light on brands that generate the most endorsement on Facebook. This ACE model is the one we’re using in our analytics and reporting solution (it’s free, test it!). We think that this enables our users to have a much more accurate view of the engagement success of their competitors than a single, but flawed, score.